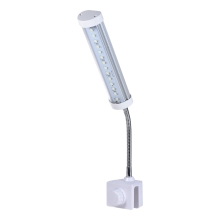 Super bright & energy efficient LEDs, which produce amazing shimmer for your aquarium. Extra light-weight aluminum shell, heat dissipates evenly during the working process. Half-loaded 5730 lamp beads, work under rated power, ensures for much longer life than other products. Flexible clip light, easy-installation and convenient for use. Great night light for nocturnal viewing.